Everyone knows the ubiquitous Kingsford charcoal used by most people on their charcoal grill or barbecue. These pressed charcoal briquets are available just about everywhere and are available in many types. However, there are other options! You have a choice when cooking on your charcoal grill so take a quick look and learn a bit about different types of charcoal. Pressed Charcoal Briquets - This is the typical charcoal briquets that we all know and have probably used on our charcoal grill or barbecue, such as the standard Kingsford charcoal you see in most supermarkets. It is typically made from small pieces of wood and other organic materials (seeds, pits, etc.) which have been pressed together into briquets. It often has chemical binders and igniters that help it light easier and burn longer. Pros - Easily accessible and cheap! These light easily and burn a long time, supplying good intense heat for all your charcoal grill or barbecue needs. Cons - Not entirely made from real hardwood firewood so the smoke flavor given off is not as pure and intense. Contain chemical additives as binders and igniters. 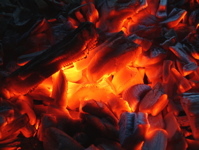 Pressed Charcoal Briquets with Smoking Woods - Some producers of charcoal include flakes of smoking woods, most commonly mesquite and hickory, in their briquets, adding flavor of real smoking woods to your charcoal grill or barbecue. Pros - Improved wood smoke flavor over the regular pressed charcoal. Also widely available and inexpensive. Cons - Again, made from particles of wood and other organic material bound with chemicals, so while this may have more wood flavor than the above, it still has some of the same disadvantages. Match Lighting Charcoal - Most producers of the above types of charcoal make a "match lightable" version, such as Kingsford's Match Light® line of briquets. These include kerosene-like lighter fluid chemicals which make igniting your charcoal easier without having to add more lighter fluid or use other charcoal starters. Pros - Same as above but also easier and faster to light. Cons - Same as above but with more added chemicals. Lump Charcoal - Lump hardwood charcoal is pure hardwood pieces which have been charred. They come in several forms and from different types of hardwood. Several producers make them from different woods and with different size briquets. Learn more about lump charcoal. Pros - For the flavor purist, these offer intense heat and smoke from real, unadulterated hardwoods. For you natural types, this charcoal has no additives or chemicals. Gives intense heat. Cons - Tend to burn faster and loose heat faster than pressed briquets. Significantly more expensive, varying from around $8 to $20 per bag (2 to 5 times more than Kingsford). Where to get it: Most basic pressed charcoal brands can be found at any local supermarket, grocery store or even hardware and home supply stores. However, to find more specialized lump charcoals you may need to venture a bit further. Specialty grill shops generally have a large selection of hardwood charcoal. Also, you can order them online although shipping costs may make this unrealistic. The bottom line, you can create a delicious meal on your charcoal grill or barbecue with most any type of charcoal. However, different types will have different advantages and personal preferences may push you to prefer one type over the other. Now that you know what to look for, go try each for yourself and see if you can notice a difference. The most important thing is that you like the flavor and find the charcoal easy to use. Done finding the perfect charcoal for your charcoal grill or barbecue? Go back to the All About Charcoal page.